The year is 1185. Minamoto no Yoshitsune stands in the prow of his boat as it speeds through Daimotsu Bay in the province of Settsu (Modern day Hyogo prefecture). Yoshitsune is fleeing from his brother, Minamoto no Yorimoto, who recently seized power from the Heike clan and declared himself Shogun. Yorimoto sees his brother as a potential rival. By exiling himself from the capital, Yoshitsune hopes to calm his brother’s jealousy and paranoia. The omens for the trip had not been auspicious. Yoshitsune had been forced to leave behind his mistress, the famed dancer Lady Shizuka. But during a farewell dance she performed in his honor—her masterpiece shirabyoshi, also known as The Parting—her headdress had toppled to the floor. The seas were rough, and Yoshitsune thought of delaying his flight. But his faithful retainer, the mighty Musashibo Benkei, had pressured Yoshitsune into leaving without delay and braving the tumultuous seas. Delay could mean Yoshitsune’s death at the hands of his brother’s soldiers. At first, the voyage went well despite the roughness of the seas. Then things changed. As the boat left behind the shores of Daimotsu Bay and headed towards the Yoshino mountains, a mist rose up without warning swallowing his ship and cutting off all light. From the sea arose great waves that battered Yoshitsune and his men, tossing their ship around like a toy. Yoshitsune’s ship was stuck in the sea—unable to advance or retreat, as if in the grip of some supernatural power. Looking over the side of the boat revealed the truth—this was no sudden squall. Hidden in the depths of the waves were the white bodies of the warriors of the Heike clan recently destroyed by Yoshitsune himself. Skeletal hands swarmed about the ship, holding it fast in the water. The ship was going nowhere but to Hell. One of the ghostly warriors leapt from the ocean onto the ship. At a glance, Yoshitsune knew who it was—Taira no Tomomori, dread general of the Heike. His eyes blazed red with wrath as he swung his massive naginata long-spear and maneuvered to engage Yoshitsune. Remarkably, Yoshitsune betrayed not the slightest glimmer of fear. He calmly drew his own sword and prepared to face off with this dead warrior. The warrior-monk Musashibo Benkei knew that the day would not be carried by skill at arms. No matter how deadly his master Yoshitsune’s blade was, it could not cut dead flesh. But Taira no Tomomori’s naginata had no such concern. Bento dropped to his knees and began to chant and earnest prayer to the gods. He called on the five directions—the deities of the North, South, East, West, and the mysterious fifth and unknowable direction. While Yoshitsune’s steel held off Taira no Tomomori’s attack, and the rest of the onryo of the defeated Heike clan continued to assault their ship, Bento fought a spiritual war of faith and devotion, pitting his prayer against the power of the dead. Such was the earnestness of Benkei’s spirit and the devoutness of his prayer that the waves and mist dissipated as quickly as they had arisen. The vengeful ghosts of the Heike vanished, unable to stand against the protective power of the gods. There attack was over, and Yoshitsune and his men peacefully continued their flight from Kyoto. An “oldy but goody,” as they say. 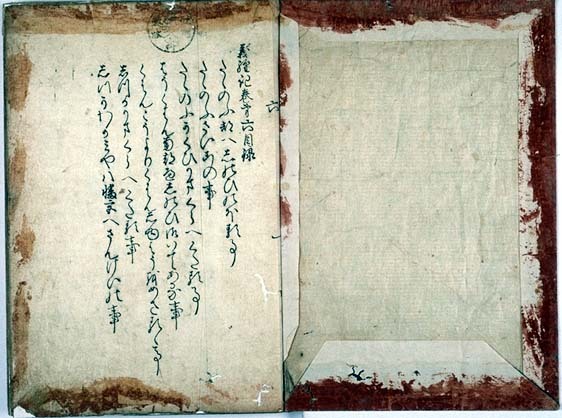 This story of attack on the Yoshitsune’s ship by the onryo of the Heike first appeared in the book Gikeiki (Chronicles of Yoshitsune). Gikeiki is an interesting book. It took elements of the quasi-historical Heike Monogatari (平家物語; Tales of the Heike) and added fantastical elements, such as Yoshitsune being trained by the mountain spirits the Tengu, and giving him a mystical companion in the form of Musashibo Benkei—known in his youth as Onikawa the Demon Boy. I guess you could say Gikeiki is an ancient equivalent of Abraham Lincoln: Vampire Hunter. This particular passage, with the spiritual battle of Benkei against the Heike onryo, was adapted for a Noh play by Kanze Kojiro Nobumitsu. called Funa Benkei (船弁慶; Boat Benkei). Just in the title you can see that Benkei is the star of the show, and Yoshitsune is reduced to a supporting role. Funa Benkei was later adapted into a Kabuki play and continues to be popular. 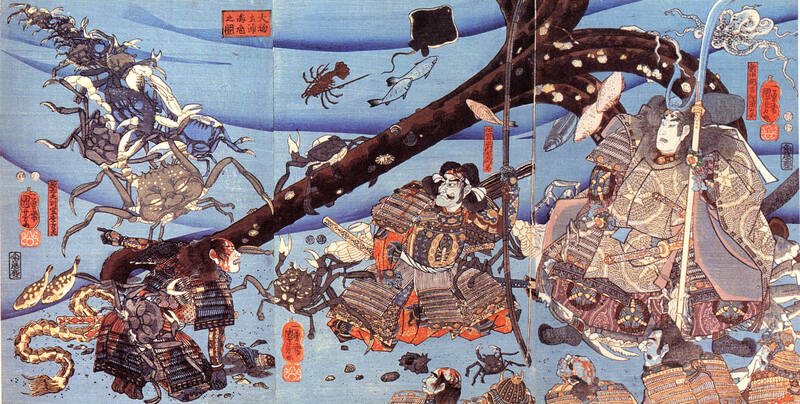 Several artists have depicted the climactic battle of Funa Benkei, most notably Utagawa Kuniyoshi in his triptych Sesshu Daimotsu-no-ura ni Heike no Onryo Arawaruru no Zu (Depiction of the Appearance of the Vengeful Ghosts of the Heike in the Bay of Daimotsu in Sesshu). Oh, and while Benkei’s actions may have diffused the desire for revenge in the Heike ghosts, he could not rid the world of them entirely. They would later appear to torment a hapless, blind lute player into endless repetitions of songs singing their praise (in the story Miminashi Hoichi, by Lafcadio Hearn) and many say they have been reincarnated as a distinct species of crab that lives in the waters off the shore of Shimonoseki—the Heike Crab.